"Tzom Kal." It's a simple Hebrew greeting often used on Jewish fast days that, idiomatically, means "have an easy fast." Of course, that's more easily said than done, especially on Yom Kippur and Tisha B'Av, two 25-hour fasts during which all food and beverages are prohibited. Mild discomforts—a grumbly belly, slightly achy head, dry mouth—are to be expected, and can even help sensitize us to the plights of those who live in poverty or struggle with food insecurity while inspiring mindfulness of the many blessings in our lives. If we're feeling extraordinarily hungry or ill, it can be incredibly hard to focus on the spiritual work of the day. So how do you fast well—and stay well—on Yom Kippur, Tisha B'Av, or even the shorter fast days that occur throughout the year? Most of the discomfort we feel during a fast is due to under-hydration. Simply put, our short-term physiological need for water is much stronger than our need for food. The best way to mitigate the discomfort is to enter the fast well hydrated. In the week leading up to the fast, try to drink several glasses of water a day. Keep in mind that by the time you feel thirsty, you're probably already a bit dehydrated, so if you tend to get thirsty, it may be a sign that you should make an effort to drink a little more often. 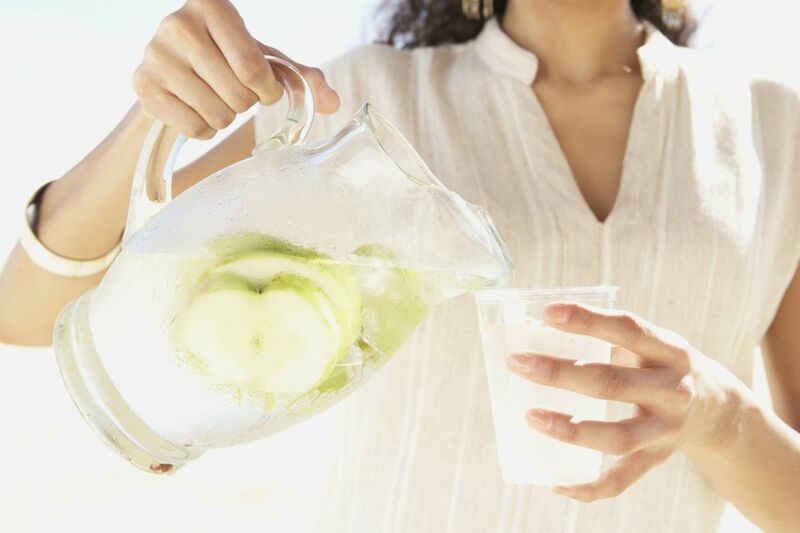 Plain water (sparkling or still) is the best hydrator, but you can flavor it with herbs, fruit slices, a splash of juice, or herbal tea if that inspires you to drink up. Caffeine withdrawal is another big culprit behind fasting discomfort—especially nasty headaches and nausea. If you're a coffee fiend (or if you drink a lot of soda or caffeinated energy drinks), it's a good idea to scale back your consumption early in the week before the fast. Try starting with half-caff coffee, or switch to black tea, then move on to green tea, which has less caffeine. Like an athlete before an endurance event, you want to build up your glycogen stores, so your body has the energy to tap for the fast. Start the day with a wholesome, whole grain breakfast, like oatmeal or quinoa porridge with fruit and nuts. Snack on healthy, hydrating foods during the day—think juicy fruits with nuts or whole wheat pita with hummus and cucumber slices. For lunch, try a low-sodium soup with a pasta dish or grain salad. As for the pre-fast meal, try not to rush it. It's tempting to eat as much as possible right before the holiday starts in an attempt to avoid hunger during the fast, but feeling over-full can be equally uncomfortable, and may make it hard to hydrate. Plus, if you eat too much, your blood sugar will spike, and your body will respond by pumping out insulin to normalize it, which in turn will make you feel hungry all over again! Take your time, gauge how you feel, and eat until you're satisfied, but not stuffed. Choose fiber-rich foods, quality carbohydrates, healthy fat such as olive oil, and plant proteins, such as whole grain pasta, lentils, or beans. These will do the best job of giving your body sustained energy during the fast. Try pasta with roasted vegetables and chickpeas drizzled in olive oil. Avoid large amounts of animal protein, which may lead to dehydration. A hard-boiled egg or small omelet is a good, simple option. Melon, pineapple, apples, or pears are smart choices for a fiber-rich, hydrating dessert. Be sure to skip the salt shaker—too much sodium can make you feel thirsty during the fast. Unless you're on a sodium-restricted diet, you don't need to avoid salt altogether—a little bit will help you stay hydrated. Keep in mind that sodium is a naturally-occurring component of many foods, and it's present in often shocking amounts in processed foods, so you don't need to add it to the meal. Fasting may be uncomfortable, but it isn't meant to be torturous, and should never be dangerous. If you have a medical condition or illness, require medication that impacts your blood glucose levels or must be taken with food, are pregnant, nursing, or have just given birth, take the time to talk to both a trusted rabbi and your doctor or midwife about any concerns you have about fasting or dealing with your prescription regimen. If you've been advised by a medical professional that fasting is dangerous for you, you should not endanger your health by fasting anyway. If you begin to feel ill during the fast or are required to eat, it is usually considered most preferable do so in shiurim (measured amounts, usually less than a cheekful) in intervals of at least 9 minutes. If necessary, the intervals may be reduced to every 5 minutes. In cases of emergency, this is not relevant—someone who is in imminent danger should eat or drink in whatever fashion is necessary to stabilize or restore their health. Children under bar or bat mitzvah age (13 for boys, 12 for girls) should not fast. In the year before, they may try to fast for part of the day if their pediatrician approves and if they'd like to "practice." Rookie fasters should be monitored for signs of dehydration, illness, or extreme discomfort. Rather than guzzling water, start slow with something hydrating and electrolyte replenishing. Try a piece of melon or some grapes, a small glass of juice or a little tea with honey. Maybe a bagel and some lox. Take your time with the meal. It's easy to pile lots of food on our plates and eat quickly, but it's far healthier and more enjoyable to slow down and savor the meal and company. Your senses will be heightened after the fast, so take advantage of the chance to enjoy the flavors, aromas, and textures of the food. You'll likely find you're satisfied sooner than expected.